Armorgard have recently added a number of items to their range of secure storage products, making them now a number one supplier offering a whole host of storage solutions for tools, equipment and hazardous substances. With a number of requests over the years for a Knaack Field Station, Armorgard have now designed their own version, with many user benefits. Used generally as a multi-purpose site store, they are useful for securing anything from PPE to power tools, and from copper fittings to site plans. Various different compartments means that you can have the main door open, but still have a secure area within the store. Lets face it; the biggest thief on today’s construction site is the contractor working behind you. When your back is turned he will happily help himself to anything in sight. 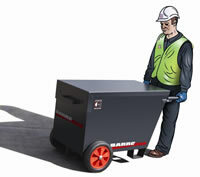 That is why many contractors are now turning to the new Barrobox (sometimes referred to as a 'Barrow Box') from Armorgard – always keep you tools by your side, but in a secure lockable vault! The internal handle controls the wheels – wind them down and you have a mobile site box, wind them up and your site safe is static! Take your tools with you wherever you are working on the site! The most innovative gas cage on the market! With the majority of gas cages being used as a temporary store, gone are the days of needing to unbolt it or even store it as a fixed unit. The new cage from Armorgard is fully collapsible with no detachable parts to worry about. Particularly popular with the hire industry, they fold up very neatly for storage and transport. The TuffCage is manufactured from heavy grade galvanised steel, and is available in one standard size. 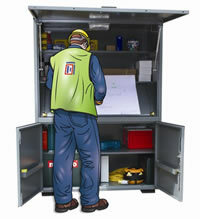 Armorgard is a specialist manufacturer of renowned tool storage and manual handling products. Armorgard have recently appointed an official distributor for The Netherlands. This means that they now have a presence in France, Germany, Ireland, Denmark, Sweden, Norway and now.